***Book received for review. Post contains affiliate links. All thoughts are 100% my own. "I wish I could see myself the way THEY see me." I've had this thought many, many times... have you? Anytime I receive a compliment be it on a skill I might have or an outfit I'm wearing, I find myself second guessing whether that compliment was sincere. I mean... it's certainly not how *I* see it. We as women are hard on ourselves. We so often focus on the person that we wish to be--- that perfect non-existent versions of ourselves--- that we fail to realize that we are pretty fantasatic just the way we are. Perfection? That's just a dream! It's unattainable, and we will drive ourselves crazy trying to get there. Believe me, I know! But how can we embrace the things we wish we could change? If there is one thing Lincee Ray has learned over the years, it's that the majority of women on the planet struggle with insecurities. Our skinny jeans mock us. Our just-trying-to-help mothers are just driving us crazy. Our social media feeds taunt us with everyone else's picture-perfect lives. It's enough to send you on a gummy-bear bender while binge-watching Friends reruns and not showering for a week. Lincee knows. She's been there. Right there, in fact. Gummy bears and all. 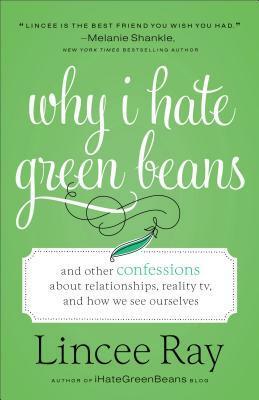 For every woman who's ever wondered if she's unlovable, uninteresting, or unattractive, Lincee offers her particular brand of hilarious (and hard-hitting) self-reflection. Like a true friend, she shows us that the fastest way to happiness is to embrace ourselves in all our imperfection, trust that God knew what he was doing when he made us, and maybe go buy a new tube of mascara. Walk alongside Lincee as she discovers that her identity is not found in her job, her relationship status, her bank account, or her social circle. It's found in Christ. If that title didn't give it away, let me just say it here and now: this book is HILARIOUS! If you're looking for a book with tips and tricks to move past your own insecurities, this isn't going to be it. But you know how they say that laughter is the best medicine? Yes, this is that. Lincee shares fantastic stories about her life that will have you stifling a laugh as you read through the night. She doesn't share those stories that show the best of the best... no, she shares the stories that most of us might be too embarrassed to admit. But in sharing these stories she reminds us that we are ALL human. We all have embarassing stories. We all try, and we all have our fair share of failures. We are imperfect, and insecure... but we have an amazing God who loves us all the same. If you're looking for an escape from your own every day and just need a good laugh, this is one book that is certainly worth reading. It is available to purchase now at your favorite Christian book retailers.